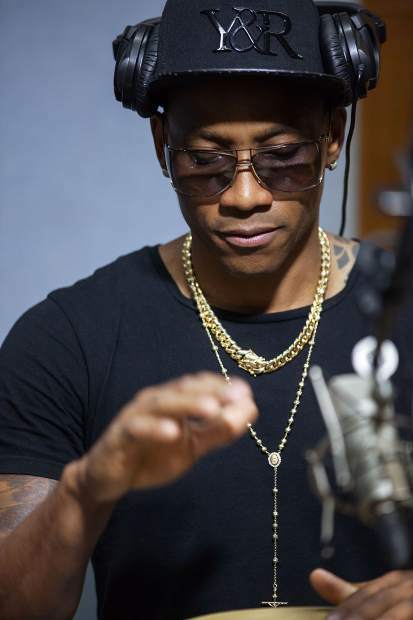 Afro-Cuban percussionist and vocalist Pedrito Martinez will headline the JAS Cafe at the Cooking School of Aspen Feb. 22 and 23. Award-winning jazz vocalist Dee Dee Bridgwater, Cuban percussionist Pedrito Martinez and singer Jose James are among the headliners coming to the JAS Cafe this winter. Jazz Aspen Snowmass announced its full lineup for the JAS Cafe winter series Friday. Performances will be held in two venues this winter — the JAS Cafe Downstairs at the Little Nell and the JAS Cafe Downstairs at the Cooking School of Aspen. The winter series kicks off Dec. 21 and 22 with vocalist Niki Haris, but did and the James Horowitz Trio. Harris, daughter of legendary jazz pianist Gene Harris, shares the same ebullient, swinging style drenched in the sound of the blues. Expect a tour of diverse standards old and new, blues and soul. In a special holiday performance, Grammy and Tony award-winning jazz vocalist Dee Dee Bridgewater will appear Dec. 29 and 30 at the Cooking School venue with her new project, “Memphis,” a groundbreaking re-imagining of American Blues and R&B classics made famous by iconic Memphis artists. During Winterskol weekend, Jan. 12 and 13, vocalist Tatiana Eva-Marie and The Avalon Jazz Band will appear at the Little Nell. Ambassadors of Parisian “hot jazz,” Avalon Jazz Band performs a mix of 1930s and ’40s Gypsy jazz. On Feb. 2 and 3 triple-threat talent Katie Thiroux will bring her bravura bass playing, assured singing and compelling compositions to the Nell. February also will bring Grammy-winning virtuoso guitarist John Jorgenson and his Quintet to the Cooking School on Feb. 9 and 10 with a program of contemporary world music and the return of the fiery Grammy-nominated Afro-Cuban percussionist and vocalist Pedrito Martinez and his group, also at the Cooking School, Feb. 23 and 24. The Cafe returns to the Nell on March 2 and 3 with Brazilian vocalist Teka and the Roger Callaway Trio with special guest Tom Scott. Teka’s music is a fusion of the sensual rhythms and harmonies of Brazil with the sophistication and improvisation of jazz, which she calls New Bossa. Scott is a renowned composer, arranger, producer and saxophone/woodwind recording artist. He has 34 solo recordings to his credit and has earned 14 Grammy nominations and 3 Grammy awards. On March 16 and 17 at the Cooking School, Blue Note recording artist Jose James presents “Lean On Me: Jose James Celebrates Bill Withers.” Vetted personally by Withers himself, the show is an exploration of the deep musical catalog that touched millions, including songs such as “Ain’t No Sunshine,” and “Just the Two of Us.” The breakout vocalist and his jazz band give a new twist to classic R&B and soul icon. The winter series will conclude March 30 and 31 at the Nell with the versatile and deep-rooted 16-year-old pianist and Hammond B-3 organist Matthew Whitaker, a prodigiously talented artist personally mentored and championed by Stevie Wonder and already having played around the world. Many of this winter’s Cafe shows will feature JAS Listen Up! pre-concert artist discussions, in which performing artists share stories and insight on the music they’ll perform and what to listen for. Currently scheduled Listen Up! talks include Thiroux, Jorgenson, Martinez, Teka and Whitaker. Both The Little Nell and the Cooking School of Aspen will be offering a special three-course dinner menu at all 7 p.m. performances for $49. Select items from the Little Nell or Rustique bar menu will be available at all 9:15 shows. Tickets for the series go on sale 9 a.m. Monday and can be purchased at 970-920-4996 or at jazzaspensnowmass.org. Individual show tickets range from $40 to $75.